Smoothies are a powerful tool in your healthy eating arsenal – you can pack stacks of fresh nutrition into them, including supplemental nutrition such as chia seeds and green powders such as chlorella, spirulina and wheatgrass. The trick with healthy smoothies is to make sure you aren’t just making yourself a big glass of fruit sugars. It’s easy to inadvertently pack them full of fructose, but adding veggies into the mix will lower the sugar load and increase the vitamin and mineral content. They will also keep you energised and fuller for longer. Here are a selection of the smoothies I have posted mostly on my Facebook page when I’ve made them. But the best way to approach smoothies is to experiment! One more tip: Some of my clients love smoothies but don’t make them often because they don’t have time to make them in the morning before heading out to work. 4. Don’t forget to take it with you in the morning! Although your smoothie will lose a % of it’s nutritional content over making and consuming it fresh, this method of storing it cold and full to the brim will keep the loss to a minimum. Think of it this way – consuming 60-70% of the maximum potential nutrition is 60-70% more than not consuming it at all! 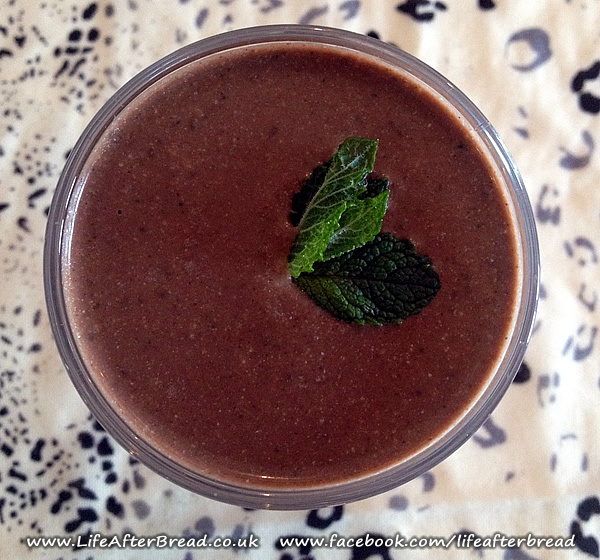 Try this power-packed smoothie for breakfast or any time you simply need chocolate! It’s ridiculously chocolatey but it’s also packed with protein, fibre, vitamins, anti-oxidants, only natural sugar and will keep you satisfied. The added cinammon even regulates your blood sugar. If you have a good liquidiser you can bang all the ingredients in a whizz until smooth. If ,like me, you use a hand blender: moosh the dates and banana fisrt until smooth. Then add the spinach leaves, hemps seeds, chia seeds, cinnamon and mint and smoosh again with a little of your liquid. Add extra liquid until required consistency. Pour, enjoy and feel absolutely NO chocolate guilt! Notes: raw chia seeds and hemp seeds can usually be found in your local health food store. They are amazing sources of protein, fibre and omega3 fatty acids – helping you to stay full for longer and improve your cardio organs and brain power.